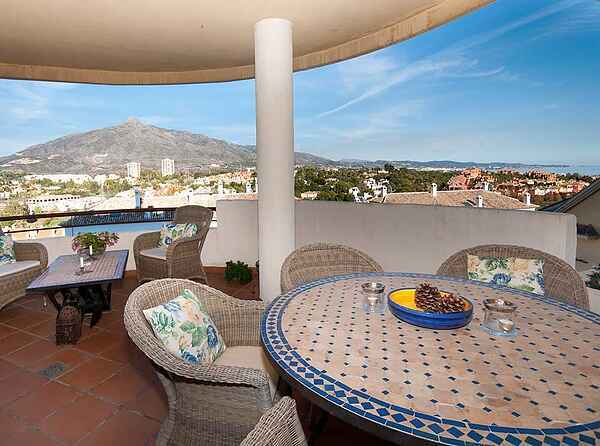 This apartment gives you a perfect view over mountain and sea and golfcourses - still only minutes away from the temptations of Puerto Banús. The Señorio is located in Nueva Andalucia which is ideally situated in the outskirts of sizzling Puerto Banús and with local restaurants, shops, supermarkets. The views from all five balconies are very nice. Apartment is spacious and contains 170 sqM + 70 sqM balconies on 3 floors. Marbella within 6 km , a little further away the Gibraltar (duty free area with the only European monkeys), Ronda and and many beautiful small towns and villages. The contrasts are breathtaking: Puerto Banús harbour with all the ships and shops, Ferraries, Bentleys, restaurants you have ever dreamed about and within the same 15 minutes golfcourses set by the top designers and mountain villages with nothing but silence and a pace like 100 years ago. The local area is packed full of amenities for people of all ages with golf, beaches and nightlife. For the golfer, there are five golf courses very close by- and another 30 within 15 minutes car-drive. The close ones are: Los Naranjos Golf Club, Golf la Dama de Noche, Real Club de Golf las Brisas, Aloha Golf Club and La Quinta Golf & Country Club. From the apartment you can see the Las Brisas . They are set in beautiful surroundings and offer a game for all levels of players. Other sports facilities nearby include a gymnasium, tennis clubs and riding stables. In the gated area with 24H security guard there is a paddle tennis court free to use. Nueva Andalucia beach, just to the east of Puerto Banus harbour, is a busy tourist beach offering all sorts of water sports such as windsurfing, jet-skiing, water bikes etc in main season. You can also hire sun beds or sit and watch the world go by in one of the four beach restaurants- the one close to River Verde is our personal favorite. There are also more beaches adjacent. To the west/right side looking towards the harbour- there are smaller lagune beaches with less waves and rather shallow water- to be preferred for children.